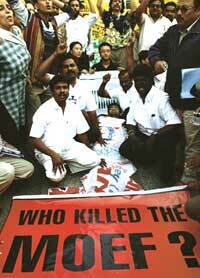 ON NOVEMBER 14, 2005, protesters from about 80 non-governmental organisations (NGOs) from across the country held a sit-in at the ministry of environment and forests (MoEF). Under the banner of Campaign for Environmental Justice, India, protestors demanded the scrapping of the proposed reform of the environment impact assessment (EIA) notification and the draft national envi-ronmental policy. The protesters' main complaint was that the proposed draft threatens to put industrial and commercial projects that are potentially harmful to the environment on the fast-track. The draft restricts public participation and increases discretionary powers vested in the ministry and state pollution control boards (PCB)without committing them to increased accountability. The draft weakens provisions guaranteeing access to information and public involvement. It is mandatory for the area MLA to be on the panel of experts. However, industrial organisations protest this will lead to needless interference from the politicians. The MoEF released the environmental clearance process on September 15, 2005. The draft was open for public comment till November 14, 2005. The proposed process has a number of loopholes (see 'Dead and Buried', Down To Earth, September 15, 2005). Protesters stormed the central government office complex and sat in the MoEF's lobby demanding to meet the minister or the secretary, Pradipto Ghosh. Soon after, Ghosh got the entry of press into the complex blocked. Ghosh did not meet the protesters but asked them to send a representative from each region to submit a memorandum. The protesters refused and continued the sit-in till evening.